Having a garage attached to your house is a wonderful convenience. It can provide you with a space to work on projects and store furniture and other household items. Most importantly, however, it can shield your vehicle from the elements. Along with owning a garage comes owning a garage door opener. These amazing devices have an interesting history, and we'll take a look at them in this article. Garage door openers weren't always as common as they are now. As a matter of fact, from the early to the middle part of the 20th century, garage door openers were largely found in the homes of the well to do. As with most devices, advances in technology helped make them more accessible to all people. Now, in the early 21st century, one is more likely to find houses with these incredible devices than a house without one. As stated in the previous paragraph, technology allowed more people to experience the convenience of remotely opening their garage. Technology has also changed the nature of these devices, allowing users more safety and more layers of security. The early garage door openers were manual in nature, in which someone had to open the door to allow the car to enter or exit. It would seem that having to manually open the door would negate the convenience of the device. Imagine being exposed to the elements your garage is protecting your car from, just to be able to open the door! 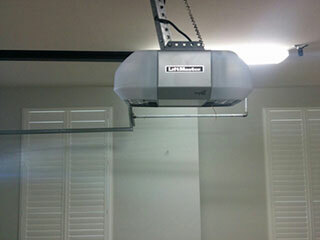 Fortunately, some enterprising individuals created remote garage door openers. This amazing innovation allows users to open the door without having to get out of their car. The early remotes used a “fixed” code which was input by the users, which opened the door. There was one problem though: thieves and other criminals could learn this code, input it, and have access to valuables stored in the garage. Yet once again, technology came to the rescue. A new type of remote opening system was introduced, which used a variable code in the place of a fixed one. With the arrival of remote openers came a whole new set of safety concerns. What if the door was closing, and a pet or a child ran under it? Would they be crushed? In order to prevent this horrible scenario from happening, manufacturers introduced safety reversal mechanisms, and they became the industry standard in 1982. These devices employ sensors, usually photoelectric in nature, that can detect when a person or animal runs under the garage door as it's closing. When something is detected, the door stops closing and opens again. Safety devices such as the reversal mechanism, and the remote entry, have enhanced the quality of garage door openers, making these already helpful devices even more convenient. Furthermore, technology has allowed everyone access to this amazing innovation.